A stranger comes to town, the rich villain in his compound and the greedy betrayals. None of this is especially original for Italian westerns, after all this is standard genre fare as is the class political subtext. On the other hand it is the custom weapons, devious traps and mute acrobatics that make Sabata such an enjoyable feature and not just these things. 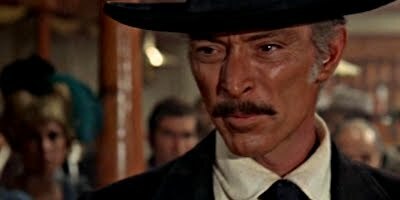 There is the cool as ice performance from Lee Van Cleef, the unrelenting pace and the sheer sense of fun that comes across in pretty much every scene. Bad guy Franco Ressel, who is seen reading a book by slavery supporting Thomas Dew, wields a knife launching cane and William Berger carries a banjo gun, itself a fine piece of musical ordnance. The result is mayhem, but in a good kind of way.